The 2011 Season Will Start In San Diego! Only one week to go for football season (real football, not that NFL thing that kind of reminds you of football). If you realized that I bet you were thinking, "hey, that must mean the start of the golf pool is coming up...". If you were thinking that then, hell yes, you were right. In just over three weeks, January 27th exactly, we will crank up the eighth year of the slowly becoming world renowned Rule 20-6 Golf Pool. The new site is up, though it's pretty much the same as last year in appearance and navigation. And a lot of things aren't live yet, though the schedule, calendar, rules and most of the record book are good to go. I don't think I'll be getting the new entry system done by the start of the year, so entries will most likely be done exactly as last year. I'll see how that goes the next couple weeks and keep everyone posted. The 2011 Pool will play a lot like the last few years, format-wise. Two seasons, 9 tournaments each season. A "Tiger May Care" (might have to change that to "Europeans May Care") pool each season. $65 for the Spring Season, $75 for the Summer Season and $10 for the Year-Long race. Still the same bargain total price of $150 for a year of golf pooling fun. It's all in the Rules of Play link on the site. The tournaments are a little different this year, due to the PGA Tour changing its scheduling. 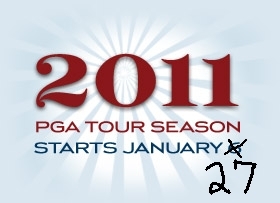 As mentioned above we will start January 27 at Torrey Pines in San Diego. We will go every other week until the Fed-Ex Cup "Playoff" tournaments. The Summer Season is pretty much the same as 2010, except the Tour is skipping the week after the Deutsche Bank (the one that ends on Labor Day Monday), so our last tournament will be one week later. The Spring Season has 4 new tournaments this year, including the one I thought we'd finally try, The Accenture Match Play Championship. I don't think we'll do anything different, just pick 7 golfers and add up the winnings when it's over. Ya might not want to pick all 7 golfers from the same bracket, but hey, that's up to you. That might give a player a better chance of picking someone who goes deep. It's the third tournament of the year and it will be different, as match play is. The last three spring tournament are new, The Heritage (we will not be awarding a plaid sports coat), The Wells Fargo Championship (it use to be sponsored by some other bank, played in North Carolina, good course, usually good field) and The Colonial in Fort Worth (lots of Ben Hogan talk, great old course destroyed by modern technology). Notice one usual tournament is missing; though I certainly don't miss it. Yes, the Players Championship did not fall into our rotation this year. So no $10,000,000,000 purse to foul up the season and year-long races. I guess that's why I put the match play tourney in there, to foul up the season. Aw, just pick seven and add it up when its over and divide up the money, right? That segues into the next topic and that is the money. Most of the people who owed significant (more that $10) at the end of last year did a terrible, terrible job paying up. This was most unfortunate and really kind of rude toward the winners. And since I went ahead and paid the winners, I guess the rudeness was on me. I will only say that this year and all future years we will be paying up front. So get your money in in the next three weeks or make arrangements to do so and everyone will be paid promptly at the end of September. If anyone knows someone who would like to join us this year, give them my email and have them contact me and we'll get them set up. I would like to cap it at 16, but I suppose 18 wouldn't be that much harder. Definitely not more than 20. Heavens no. Let's say 18, that's a good golf number. I had several mentions of interested new players last year so have the serious ones contact me as soon as possible. We only take new members by referral of a current member. I got an email for a guy in Sweden a couple weeks ago asking how he could join us ("This dang internet, it's jus' connectin' us to all kinds a' feriners."). If you are not going to play this year, let me know and I'll take you off the mailing list. A week ago I wasn't really feeling it, but after spending a day or so working on the site I'm starting to feel my golf pooling groove coming back. New tournaments, new golfers coming up, old ones trying to get their games back (you know who I'm taking about)... Oh yea, I can feel it, this is going to be one awesome year to be a golf pooler.